Growing hostas in container gardens will add beautiful color and texture to your outdoor areas all season long. They are one of the most versatile plants you can add to your container gardens. I love them and am always looking for a new variety or color to try. I started out planting hostas in my shady garden beds, but all of the ones I have grown in containers have done really well and I like having them up close on the deck and patio as well as in the shady corners of my yard. Hostas come in all sizes and in a lot of colors. Miniature types grow to only a few inches across, while large sizes may reach as wide as 6 to 8 feet. When selecting hostas for containers, just check their mature height and width. Most of the ones I’ve found in garden centers have been good sizes for pots or boxes. 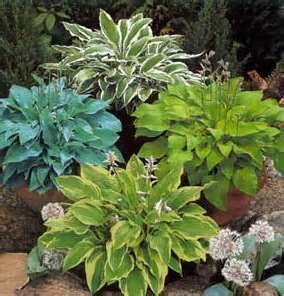 Hostas come in solid colors, or in variegated combinations. Green, blue, gold and yellow are most common and all combinations of those colors. Leaves may be coarse or crinkly in texture, or smooth and glossy. 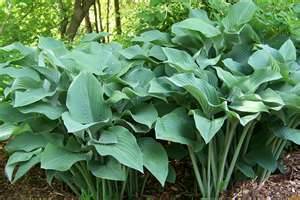 Most hostas are round in shape and grow pretty low to the ground. Others however, have kind of a vase shape – they grow up a little straight from the base of the plant and then flow wider at the top. While hostas are generally valued for their foliage, all hostas will bloom in summer. The blooms grow on stems and are small lily-shaped flowers, generally in white or pale shades of lavender. 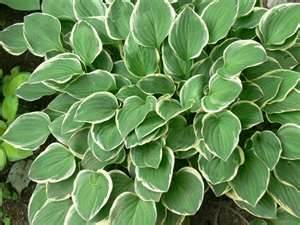 Hostas are generally considered shade plants, but most do best in partial sun. 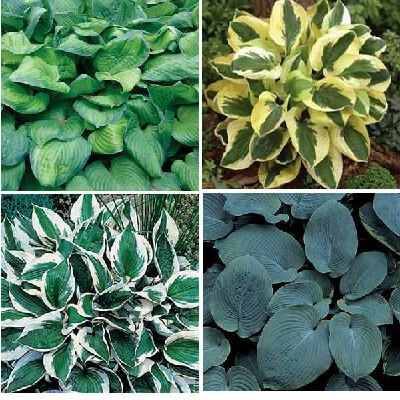 In general, the blue colors of hostas are best for full shade and the varieties that come in green, gold or yellow do better in partial sun/shade. 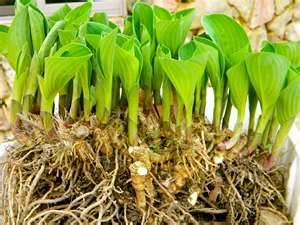 You can start hostas in container gardens from bulbs or mature plants. They like good soil that drains well. Make sure your container has good drainage and use a soil less potting mix. Add some granular fertilizer to your mix or some organic material like peat compost. Hostas prefer richer soil. They like water, so water thoroughly after planting and add an inch of mulch to help retain moisture. Keep your plants watered well, but don’t let them sit in water. If you have to use a saucer for some reason, empty it every time it rains or after yu water. Adding some pebbles or some other material to the bottom of the container before you plant will also assist in drainage. Most hostas in container gardens do well in partial sun/partial shade. Blue varieties may do best in shade – when selecting your plants check for sunlight or shade requirements and purchase according to your outdoor area. Multiplying your hostas is easily accomplished by division. Summer is the best time of the year to divide hostas. Once the plant grows to the point where it needs to be repotted, divide it up and start new plants. Warm soil and higher humidity in summer will help the new plants take root better and grow. Hostas are perennial plants and with proper care, you can enjoy them year after year. Move your hostas in container gardens to warmer locations during winter months if you live in areas that have freezing temperatures. Water lightly to prevent complete dry out. A cool location that stays around 40 degrees F during winter is a good spot – an unheated garage or shed works great. Once the danger of frost is over, move them back outside. At this time, you will want to remove the top couple of inches of potting soil from the container and replace it with new soil and mulch. Use hostas as single plants or use them with other combinations of plants to enhance their blooms or foliage.They make a nice backdrop for your flowering plants, but they are also able to make a statement on their own. Bright annuals like begonia, coleus or impatiens are lovely to use in contrast to the greens, yellows, golds and blues of hostas. 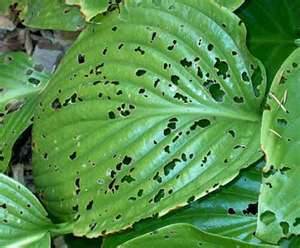 Slugs and snails are the most common pests that damage hostas. They will eat small round holes in the leaves. Hostas in container gardens can still be reached by slugs. Slug pellets are available for treatment. Also, you can wipe a ban around the rim of the container about an inch from the top with Vaseline or petroleum jelly to discourage the snails and slugs in the first place. Slugs and snails are night time eaters so if you start to see holes in the leaves of your hostas, you may need to check them with a flashlight after dark to discover the pests.